The hibachi (火鉢 “fire bowl”) is a traditional Japanese heating device. It consists of a round, cylindrical or a box-shaped open-topped container, made from or lined with a heatproof material and designed to hold burning charcoal. In North America, the term “hibachi” refers to a small cooking stove heated by charcoal (actually called shichirin in Japanese), or to an iron hot plate (teppan) used in teppanyaki restaurants. It is not known when the hibachi was first used in Japan. However, written records suggest that it was in use by the Heian period (798-1185 AD). Owing to the low availability of metal in Japan, early hibachis were made from dug-out cypress wood lined with clay. However, craftsmen soon began to make more decorative versions with lacquered finishes, gold leaf, and other artistic embellishments. Stronger materials such as metal and ceramics became popular over time. Traditional hibachis can be very attractive objects in themselves and are today sometimes sold as antiques. They were originally used mainly by the samurai classes and aristocrats but gradually spread among the general population. Their design developed throughout the Edo period. 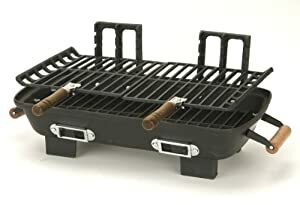 Alternatively, “hibachi-style” is often used in the United States as a term for Japanese teppanyaki cooking, in which gas-heated hotplates are integrated into tables around which many people (often multiple parties) can sit and eat at once. The chef performs the cooking in front of the diners, typically with theatrical flair—such as lighting a volcano-shaped stack of raw onion hoops on fire.